I love my electronic devices. With one click, I can add an appointment to my Google calendar and have it instantly appear on my iPhone, iPad, laptops, desktops…and anything else with access to the internet. But sometimes I need something tangible. 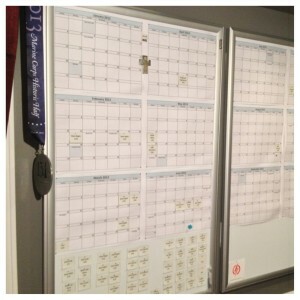 I want a physical calendar hanging on my wall that I can look at and write on with a pen or pencil (or a Sharpie!). And until I can afford a touchscreen that turns on when I gaze upon it, I’m going old school! 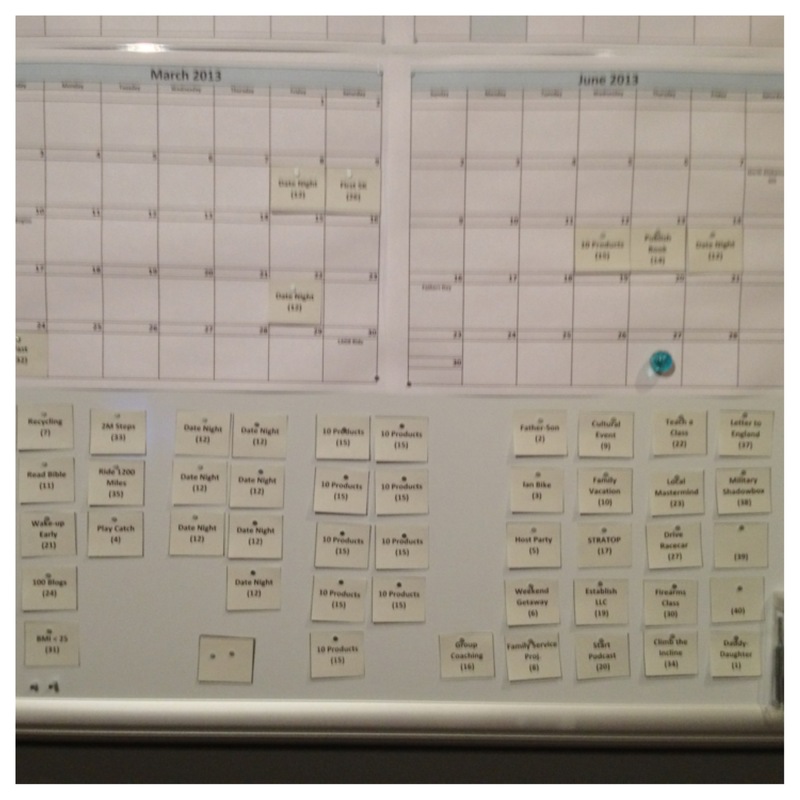 The concept for a Tangible Calendar comes from my friend, Jonathan Pool. I was visiting his home in Michigan going through an intensive two-day LifePlan (I highly recommend doing a LifePlan and Jonathan is a great facilitator/coach!). 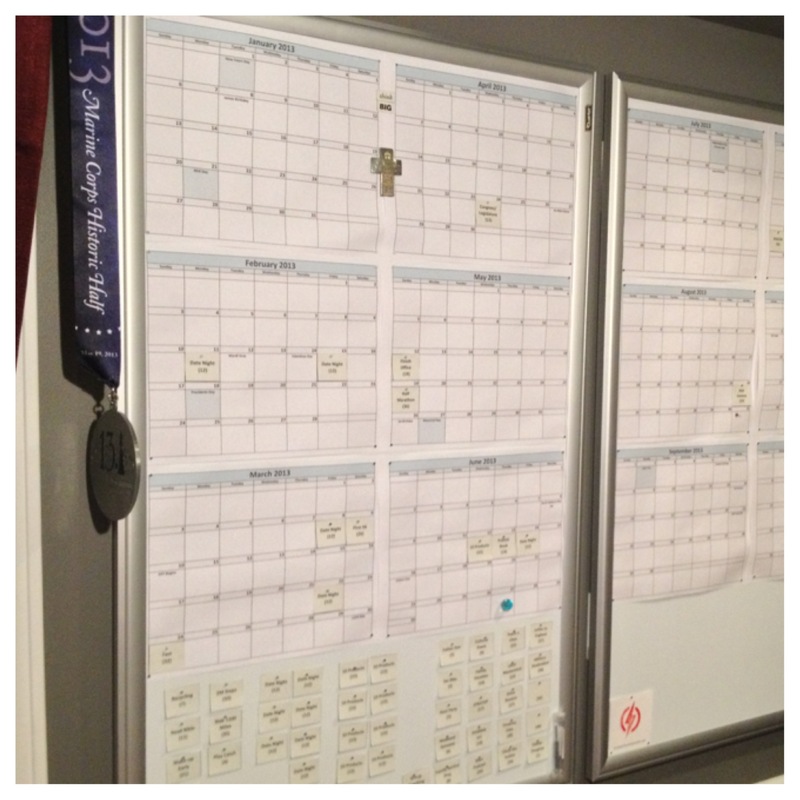 He had a full year calendar printed out and hung on a makeshift room divider. Anyone can do that…but the magic was his planning system. 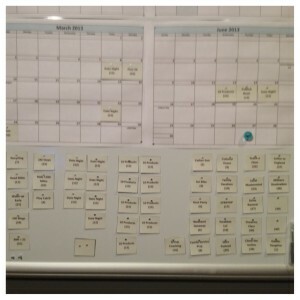 If he had a goal of conducting 10 LifePlans that year, he would have 10 Post-It notes on the side of the calendar. 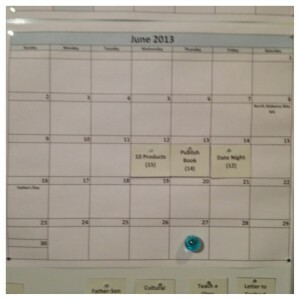 When one was scheduled, he would move it onto the calendar. With one glance at his calendar, Jonathan had an instant and tangible reminder of his goals and the progress he was making on his goals. I took a picture of his setup to inspire a version of my own. Today in my office I have two magnetic whiteboards hanging on the wall. Each holds six months of a printed calendar. I use tiny magnets instead of sticky notes. All of my calendar-based goals are printed, cut into day-sized rectangles, and attached to the whiteboard below the calendar pages. When a goal is scheduled or accomplished, it goes on the calendar for that day. I can touch it. I can see it. And that makes all my goals a bit more real than when they are just bouncing around in my head. A wide view of the two whiteboards hanging side-by-side. A closer shot that shows the calendar portion with the goal blocks, including some that are already accomplished and on the calendar. A close-up view of June 2013, when Conquer the Entrepreneur’s Kryptonite was released. These are very large and the included mounting system is horrible, but the boards are great! These mounting strips work well, but put at least four strips on each board as the boards are heavy. These magnets are tiny but powerful. I like that they don’t take up a lot of space on my goals. Get 200…they’re cheap and you’ll save on shipping because you’ll want more! Print your calendar and goals, then have fun planning out your year!